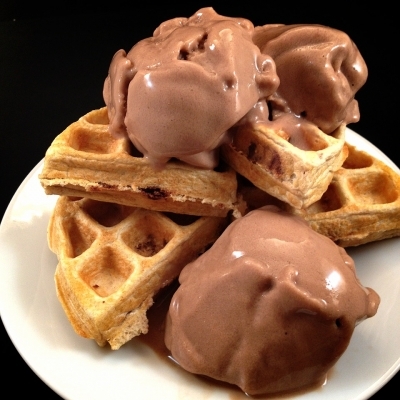 Flawless waffle recipe fit for chocolate lovers! First grind the oats into a flour. Then add the vanilla whey protein, egg whites, baking powder, vanilla extract, and stevia. Blend again until evenly mixed. Break up the quest bar into small pieces and swirl it into the batter. Spray a waffle maker with a nonstick spray and cook your waffle! If you donâ€™t have a waffle maker, the batter can also be used to make pancakes. I topped mine with low calorie almond milk ice cream!